Hanoi (VNA) – Deputy Prime Minister Vuong Dinh Hue said that policy recommendations in the EuroCham’s White Book, especially those pertaining to improving competitiveness and legal frameworks, have important value. The Vietnamese Government is determined to reform comprehensively the business environment and raise the national competitive edge, Hue stressed at his reception for Chairman of the European Chamber of Commerce in Vietnam (EuroCham) Jens Ruebbert in Hanoi on August 29. He spoke highly of EuroCham’s efforts in boosting the economic cooperation between Vietnam and the European Union (EU), as well as in publishing the White Book 2017 and its enthusiastic involvement in dialogues and policy-making consultancy with the Vietnamese Government. 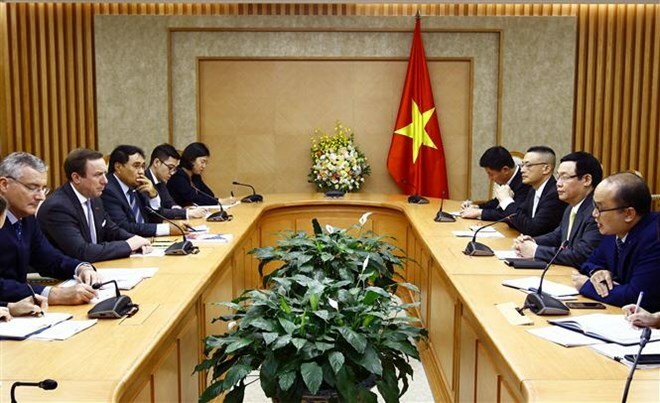 He showed his delight that the EuroCham’s members are upbeat and have belief in the business and investment environment in Vietnam, suggesting the agency to listen carefully to its members’ voice and promptly convey them to the Vietnamese Government for proper responsive adjustments. EuroCham Chairman Jens Ruebbert said apart from publishing the White Book 2017, European businesses are interested in green and sustainable growth and continue building and publishing the Green Book in the coming time. EuroCham opinioned that the EU and Vietnam should soon finalize the signing work for the EU-Vietnam Free Trade Agreement (EVFTA) to be enforced and it will spare no effort to urge the EU to ratify the agreement “as soon as possible” for the interests of businesses and people, he said.